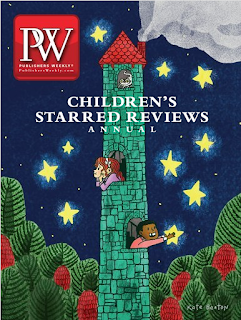 Publishers Weekly​ - who generally have all the big news in the publishing world for the USA - have a great feature on their website - you can read all the children's starred reviews from 2015 (and the book does have to be super good to get a starred review so these are the best of the best) collected together in this annual, along with a bunch of authors who have picked their favourite children's books and interviews with authors and illustrators dispersed throughout. There are 124 pages of kidlit goodness. I like that they have books grouped into some interesting sections, like one for 'Family Tales'. Also interesting to see the heading 'Nonfiction & History' as if history is somehow not necessarily nonfiction. (And points for using the one word 'nonfiction' rather than non fiction or non-fiction - this might not matter to many of you but, as a proofreader in one of my previous lives, these things cause much debate.) In YA we have 'Realism & Romance' and, as two separate sections, Fantasy & Beyond' and 'SF & Dystopia' which must have been quite tricky to separate as there seems to be a lot of crossover there. This is certainly going to be one of my go-to resources when I start buying library books this year.